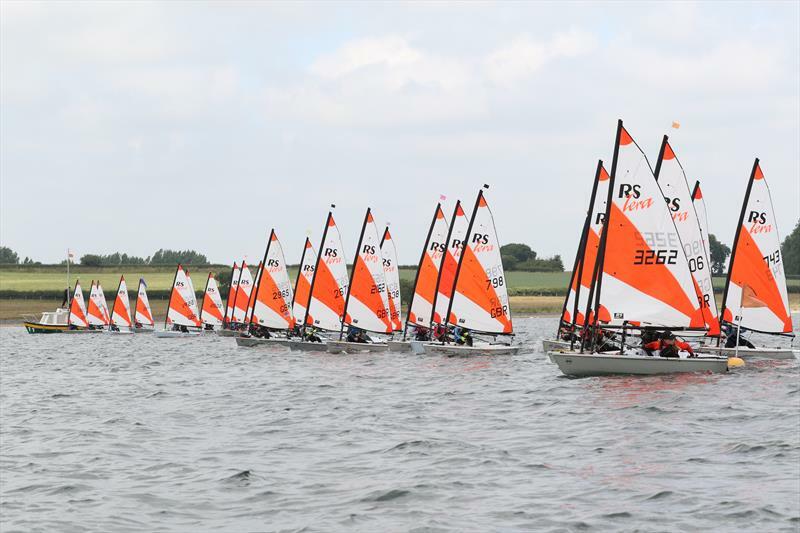 A steady breeze and glorious sunshine greeted a record turnout for the RS Tera inland Championships at Rutland Sailing Club this weekend. 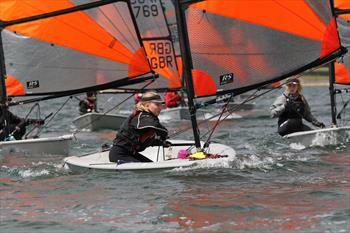 With 84 boats on the water it was set to be an amazing event. With a leisurely start of 1255 for the first race, the PRO Tom Rusbridge gave a briefing to all the sailors and they launched for four races back to back. 10 knts of wind and a slight north westerly meant the spectators were treated to a course set in front of the clubhouse and brilliant viewing. The regatta fleet enjoyed a great afternoon of coaching from Ellen Morley, Dylan Collingbourne and ex World Champion Harrison Pye followed by coached racing; after five races the overnight leaders were Caspar Barton (Bough Beech) Millie Hardiman (Bartley SC) in second and Archie Dunn of IOMYC in third. The first race in the Pros saw tight racing for the top five boats led by Robbie McDonald (HISC) followed by Ralph Nevile (Frensham Pond) and Jonathan Bailey (Hunts SC). Race 2 saw Jonathan taking line honours followed by Robbie and Blake Tudor of Brightlingsea SC in third. With a speedy turnaround Race three got underway, once again with a small group of boats pulling away from the main fleet. Ralph took the bullet with Robbie in second and Jonathan in third. With the wind tracking left for race four Robbie sped into first, old hand Freddy Wood (HISC) taking second from Jonathan in third. Overnight the positions were Robbie first, Jonathan second and Ralph in third. The Sports first race was led from the windward mark by Alice Davis (Great Moor) with a comfortable lead over Jake Thompson (Frensham Pond) and Will James (SWYSA) in third. 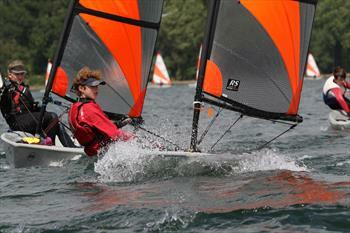 Race two saw Jakey Wood (HISC) take the win from Felix Stewart (Windermere School) and Alice in third. A fantastic battle ensued in race three between Alice and Jake Thompson with match racing between the two down the last windward leg, Alice just managing to get on the inside at the mark and take the win, Jakey Wood coming in third. By race four the sailors were beginning to tire, Jake Thompson sailing to victory followed by Tom Ahlheid (Frensham Pond) and Gregan Bergman Smith (HISC) in third. Overnight it was neck and neck between Alice and Jake on equal points but with Alice winning on countback, Jakey Wood in third. Day two dawned with more wind than forecast and clouds forming. As they launched the clouds began to clear and it was a beautiful sight to see the sun reflected on the orange sails of the eager children sailing away towards the start line. In the Pro Fleet Luke Anstey (Frensham Pond) showed his mettle at last to take the bullet followed by Club mate Ralph Nevile, Jonathan Bailey (Hunts) showing his consistency in third. Race six saw Blake Tudor (Brightlingsea) once more coming to the fore with Dylan Mcpherson climbing to second and Ben Millard (Emsworth) taking third. With the fleet well spread in race 7 Robbie came back to form and took the win from Fergus Pye (Draycote Water SC) with Jonathan Bailey once more in third. The final race of the series gave Fergus a bullet, Robbie taking the title in second and Luke Anstey (frensham) in third. 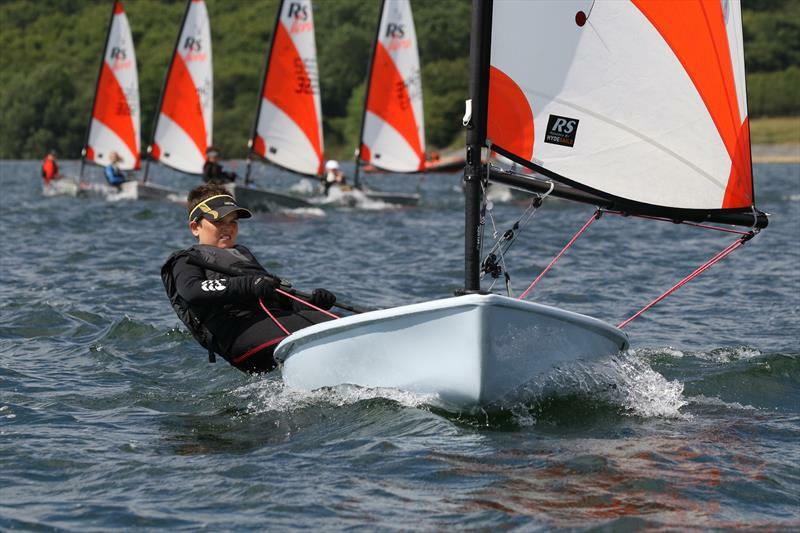 The Sport fleet saw Alice Davis winning convincingly once more in race five, with Jake Thompson keeping second place from James Johnson (Windermere School). Race 6 saw a change with Tom Ahlheid (Frensham) taking the bullet from James and Alice coming in third. This gave Jake a one point lead overall; seriously tight racing. Gregan Bergman Smith sailed brilliantly taking the win away from Alice in the seventh race, with Peter Cope (IOMYC) recovering some form in third; it was all going to come down to the last race! Jake came in first but with Alice battling through the pack from a poor start to take second, it was not enough to keep her from the title. Jakey Wood once more came third. 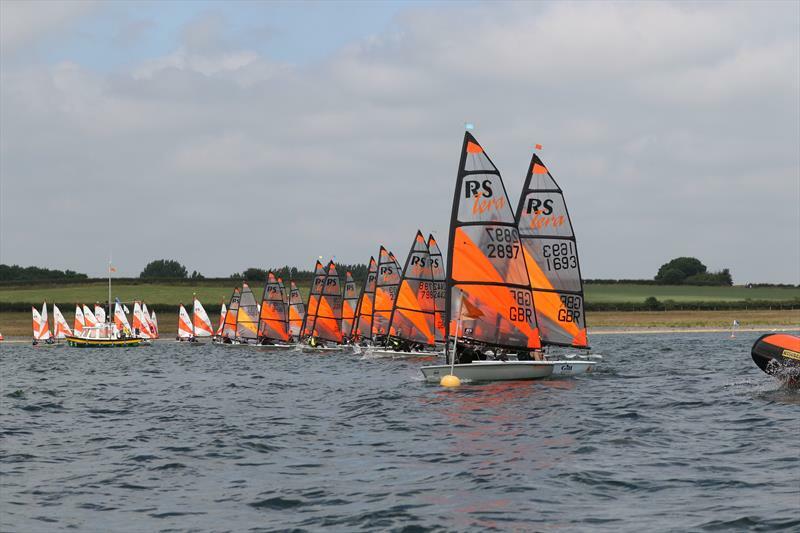 The regatta fleet again enjoyed some great racing over 5 more races, with fantastic coaching throughout for all the sailors. Caspar Barton (Bough Beech) had an impressive score sheet and came first overall followed by Millie Hardiman (Bartley) and Archie Dunn (IOMYC). All competitors in this fleet were commended on their energy and enthusiasm. We hope to see faces old and new at these events!